Call a group a “singles band” still and it feels like a barb. Perhaps it’s because singles began life as cynical, commerce-boosting products, and that legacy has lingered (“The new 7in record ensures you greater profit through faster turnover!” crowed RCA, so romantically, at the format’s launch in 1949). The album has long been seen as the ultimate expression of cleverness, too, forgetting that big ideas are often more powerful when they’re conveyed in short, sharp shocks. As one suburban sage said – someone whom the Pet Shop Boys would cover – “we learned more from a three-minute record, baby, than we ever learned in school”. A shot from the dark, a lightning bolt, a rattle of the cage: a great single can feel like all of those, and the Pet Shop Boys know that. They have plenty of them in the tank, after all, and their new one, Twenty-something, is full of their trademarks: a nagging, electronic riff, a proper narrative, oceans of melancholy just around the corner, and that vocal of Neil Tennant’s, unwithered by the years, simultaneously vulnerable and strong. The Pet Shop Boys’ singles, at their best, are like perfect short stories, giving quick glimpses into lives, appearing then disappearing, but lingering bright and long in the mind. That’s not to say their albums sag, although I’ve loved some more than others and any band that’s stuck to the one-word title for 20 albums – including compilations – deserves our applause). Their status as a singles band for me is confirmed from the framework they set with their first, though, the enduring masterpiece that is West End Girls. I’ve written about this before for the Guardian, but it still staggers me every time I hear it: a compellingly strange fusion of very British things (a 31-year-old Englishman in a raincoat doing spoken-word, the influence of TS Eliot’s The Waste Land) and American modernity (the starkness of film noir, the stark sounds of electro). From that point on, Pet Shop Boys saw the single as a world of possibility into which every influence could be poured and from which something incredible could be moulded and shined, an artefact for the ages. My childhood and adolescence was formed by this stuff. I knew from the Pets that a single could be educational, too. At nine, It’s a Sin was a dramatic thing that gave me an idea of people having a past. At 10, Heart gave words and volume to the crushes I was feeling. At 11, I’d read the words of Left to My Own Devices, pinking-sheared from the pages of Smash Hits, and wondered who could tell me who Che Guevera and Debussy were, although it almost didn’t matter. I knew they were authorities in some field or other, and that they existed to the pulse of a disco beat: that was enough. There were worlds outside my knowledge, and worlds firmly within it, and the Pet Shop Boys told me I could bring them together to live happily side by side. 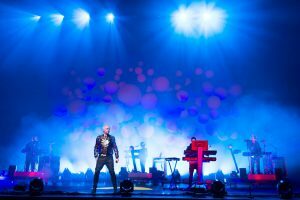 In 2016, the Pet Shop Boys are still defiantly making singles about the young, and crafting them to get on to radio playlists (although, as Tennant told me in 2013, “Radio people actually say to us now, ‘Oh, we won’t ever play your records, because you’re too old.” At 61 and 56, they remain oddly provocative, and that’s the way things should be. Long may they keep giving us short, sharp shocks, perfect short stories, to linger long, for the ages.